My dear wife and I welcomed our new son to the world back in July, and his name did not come to us easily. With our daughter, her name came easily by comparison. We had it figured out months ahead of time, were both comfortable and confident in our choice. Not so this time around. We did what most expectant parents did: we made a list. We whittled down the list to a handful. I proposed ridiculous (by modern sensibilities) names that I heard during the Liturgy or my theological reading to watch my wife’s reaction, usually this resulted in The Look. Fun fact: Eusebius is not a favorable name… but I digress. The big day came and our son was born, but we still weren’t sure about his name. After some deliberation, and after waiting for the good pain medication to wear off, we made our selection. 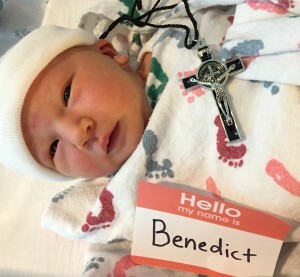 We named my son Benedict. Yes, yes, we know… there was that one guy from American History. In fact, my own father was quick to point this out seconds after walking into the hospital room. “They’re going to call him Arnold, you know.” My father-in-law feels the same way, in an interesting coincidence. Yes, I know all about Benedict Arnold… but let’s just say we were shooting higher. Is he named after the Saint, or the Pope? Both, actually… and here’s why. I have a strong admiration for Pope Emeritus Benedict XVI. I started writing this blog as part of the Year of Faith and to participate in his call to the New Evangelization. He will likely go down in history as one of the greatest theologians of our time, and he wrote 68 books, 3 encyclicals, and 3 apostolic exhortations. 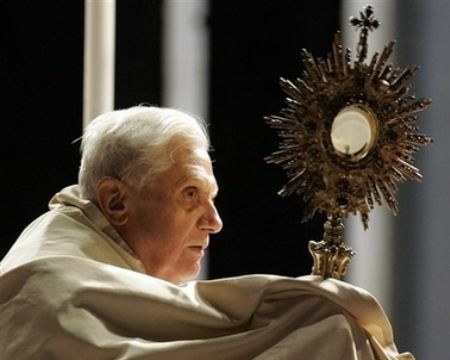 He is a defender of the Liturgy and of Catholic doctrine, and literally followed in the footsteps of a saint. If you haven’t done so yet, check out his Jesus of Nazareth series. It is mind-blowing. Over the last year or so, I have found a growing affinity to Saint Benedict of Nursia. His golden rule of ora et labora (pray and work) is a great, simple way to live life. Saint Benedict lived an inspiring monastic life, authored a Rule that formed the foundation for Western monasticism, worked miracles, and was known to possess the gifts of sanctity and strong character. 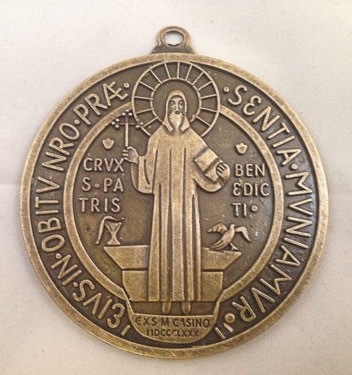 His sacramental medal depicts a well known event in Saint Benedict’s life when his enemies attempted to kill him by wine. He became aware of the plot as he blessed the cup, and it shattered. It also contains a rebuke to Satan, commanding him to drink the poison himself. 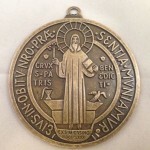 The medal itself wards against evil, poison, temptation (all of these things through Christ). He is considered to be the patron saint of exorcists, a pretty impressive pedigree… the man was basically a religious superhero, what boy wouldn’t want somebody like that as a namesake? Both men provide stalwart examples of living an authentic life in Christ, and in different ways they provide some help for learning to live this way… it seems fitting to name my son after men such as these. Our hope is that when he is old enough, Ben will look to the writings of these men for inspiration and find the examples set by their devout life a template for his own. Sort of a role model? My wife and I enjoy multiple layers of meaning to a name, and while the above outlines the primary choices… we also really like Benedict Cumberbatch (from the BBC’s Sherlock, The Hobbit, and other great roles) and Obi-Wan “Ben” Kenobi (Star Wars). This also seems to help our non-religious friends to relate to the name after their eyes glass over when I explain about the pope/saint connection. Does that count as New Evangelization? 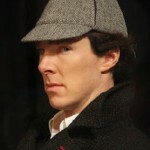 And yes, we are calling him Ben (and sometimes, Benny). 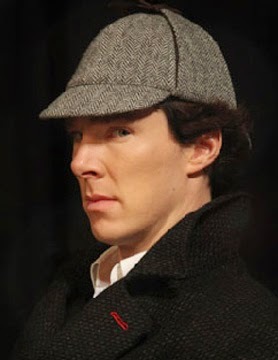 I had a woman at Church implore me to not call him Ben or Benny, because Benedict is just too awesome of a name. I’m glad to hear that some people get it! This entry was posted in Announcements, Background, Uncategorized. Bookmark the permalink.